A new free pattern by Her Greatness Kathy Merrick ! Thank you Kathy Merrick for another great pattern. 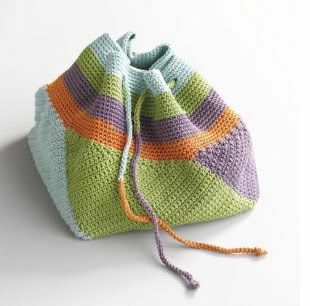 This pattern is one of the projects she designed for Kim Werker’s Crocheted Gifts. This is one of the designs featured in ‘Wrapped in Crochet’ by Kristin Omdahl and it is now a free pattern available on knitting daily TV, with a video of Kristin (I love her new haircut) to provide additional help, that you can find on You tube. This particular episode of Knitting Daily TV, #201, shows various stoles and scarfs, all downloadable from their site! How neat is that? Crochet! is now offering a digital issue : for about $15 (saving $4 on a yearly subscription) you have access to 2 years of back issues and 6 issues (including the current one). I thought it was quite a bargain and wanted to share… even if I’m still on a crochet magazines and books diet! See a sample digital issue here. 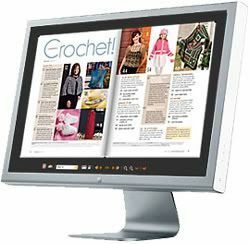 Digitally subscribe here or through the site Crochet! Is it knitted? Nope! Crocheted! Crochet isn't just for grannies, doilies and floppy funky scarves. I am - fairly - under 50, I have a crochet hook and a yarn ball handy in my purse and I like decorating my shoulders better than my sofa.